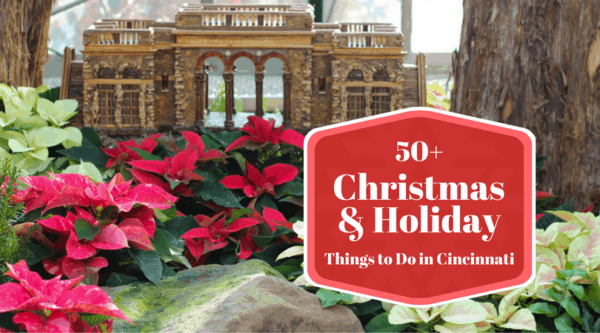 Ring in the holiday season with these fun Christmas and Holiday “Things to do” in Cincinnati! 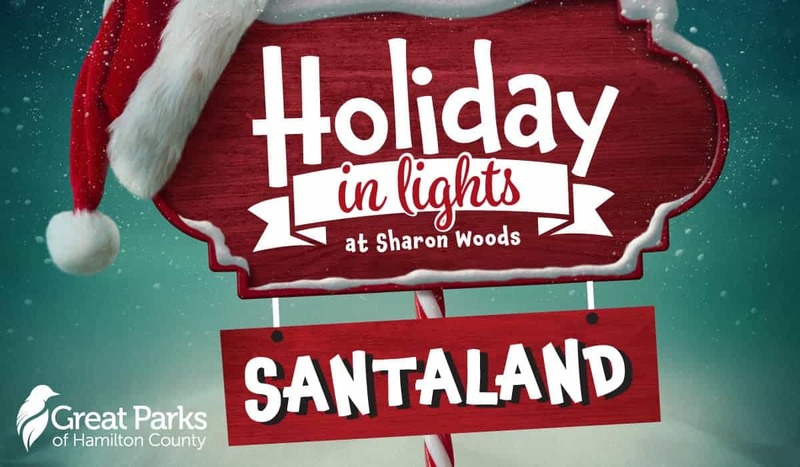 Thank you to our sponsor for this post: SantaLand at Sharon Woods! Feel the magic that the holidays bring as you step inside Santaland at Sharon Woods! Take a photo with Santa, meet Mr. Scrooge, enjoy the Dicken’s Carolers and more. Click here for details. Afternoon Tea at the Taft Museum of Art: Join in for a festive afternoon tea to complement your visit to the Antique Christmas and Paris to New York. Enjoy a delicious assortment of savory bites and sweets—including petit fours and homemade scones—alongside a fine selection of teas. A harpist will enhance your enjoyment. Special children’s price—all ages welcome! Advance registration required. Macy’s Downtown Dazzle: Nov. 24, Dec. 1, and Dec. 8 (starts at 5:30pm). See Santa and his friends rappel down the side of the Huntington Bank Center to the Fountain Place rooftop, followed by a spectacular fireworks display! The beloved Macy’s Santa will be at the Carew Tower (see site for hours). Enjoy free rides on the Cincinnati Bell Connector on Friday Nov. 23 and Saturday, Nov. 24, and Saturday, Dec. 1, 8, and 15. Santa’s Workshop will be set up on Saturdays in Washington Park, November 24-December 22, 2018. Santa and his merry band of Elves will be spending time in Washington Park making gifts, ornaments and other fun creations from 1pm to 3pm. Bring your family, bring your wish lists, but most all–be sure to bring your cameras! ‘A Franciscan Christmas’ at Christian Moerlein Event Center: You’ll see a Christmas Creche display featuring nativities from around the world. Fr. Joachim’s model trains, a Dickens Christmas village, a huge Santa Claus display, and lots and lots of decorated Christmas trees with comfortable chairs where you can sit and enjoy a beverage or food from the Christian Moerlein Taproom. Holiday Lights on the Hill at Pyramid Hill Sculpture Park, Nov. 16, 2018 – Jan. 1, 2019; Hours: Mon-Thurs, 6-9pm ($20/car) and Fri, Sat, Sun 6-10pm ($25/car); Members are $15 any day. Awaited Christmas Show at Crossroads Church in Oakley. Broadway quality show! There will be 29 shows this year! You can get FREE tickets beginning Nov 25. Is it broadcast at the Florence campus? I definitely recommend checking out Awaited. This is not your ordinary Nativity play. Free cookies, hot cocoa and more before the show. Then a broadway quality spectacular that is easily on par with anything you would see at the Aronoff. And it’s all free. There’s no “big ask” for money and no “hard sell” to try to convince you to change churches or anything like that. Just an unforgettable retelling of the Christmas story from the perspective of the angels. Great music, great effects and an inner warmth that puts you in just-the-right spirit for Christmas. Over 50,000 people saw the show last year. Because of such high demand, the number of shows is being doubled so over 100,000 can see it this year. I’d still make sure to order tickets early to be sure you get some. Sorry for the long commentary, I’ve just never met anyone who doesn’t love this show after seeing it! How do you get tickets for Awaited? Will they be available on their website on 25th? Heather, Here is the link for the show: http://www.awaitedshow.com/ Tickets don’t appear to be out yet (it says Nov. 25). Heard an interview from someone from Crossroads. Said there are always seats available because people order more tickets than they need. He said to just show up and you will get a seat. Didn’t say they would be great, but you would have a seat. Yet again, an amazing resource! Thank you so much for all the amazing information you provide! Don’t forget the Barn Quilt Trail right across the river all over Boone County. We have 80 up now. They can be viewed 365 days a year any time during the day. Free. Go to website BooneBarnQuilts.com for locations. These are quilt blocks painted on boards on barns. All can be seen from the road. Neusole Glassworks has their pumpkin/ornament blows scheduled for November and December on their website. November 14 please join the Salvation Army Toy Shop Auxiliary for their 59th annual fundraiser and doll auction at the Armstrong Chapel United Church in Indian Hill for a.silent auction, live auction, doll accessories and hand made items. Music and refreshments with homemade cookies will be served. Event is free and open to the public. Doors open at 11:00. Silent auction 11:00 to 12:30. Live auction begins at 12:45. 50 yd line tickets to the St.Louis, Baltimore & Houston games available in the auctions. See 700 dressed dolls on display to be given to needy children this Christmas. It’s a fun event, come with friends. Please also don’t forget the Cinideutsch Christkindlmarkt on Fountain Square! We are there for 4 weekends starting after Thanksgiving! The West Chester event listed for Dec 4 is not for West Chester, Ohio. Yikes! Thank you, Donna! I removed it. Could you please publish a list of Christmas concerts at area churches? THANKS! Victorian Holidays at William Howard Taft National Historic Site are free! On Saturday December 19th, everyone is invited to join us from 11 a.m. to 3: 30 p.m. for our special Father Christmas event. During this time children and adults will be delighted to learn about the traditions of Christmas and will make holiday crafts to take home with them. Father Christmas will be here taking photos with everyone and all children will receive a free photograph. Free carriage rides starting at 1:00 pm. Our Victorian Holiday Celebration will culminate on Sunday, January 3rd, when the annual New Year’s Open House will be hosted by The Friends of the William Howard Taft Birthplace. Everyone is invited to visit the Taft House from 1 to 4 p.m. to enjoy holiday refreshments with The Friends — just as guests would have during the 1850’s. All events are entirely free and open to the public! William Howard Taft National Historic Site is located at 2038 Auburn Avenue and is open from 8 a.m. to 4:15 p.m. year round. Visit the Directions page for instructions on how to get to the park. Can you add in Cincy is HOME information? http://Www.CincyisHOME.com has all of the information and includes Ale to the Queen City beer fest and a fun Passport to Cincinnati with the chance to win great prizes. Can you add our new exhibit of children’s books? Once Upon A Time: The Mysterious World of Children’s Stories is on display in the Joseph S. Stern, Jr. Cincinnati Room at the Main Library from Nov. 18 to Jan. 8, 2017. Covering four centuries and featuring traditional fables, chapbooks, nursery rhymes and fairy tales from the Public Library’s rich book collection, this exhibition is sure to delight the whole family. The Cincinnati Room’s special hours are: 9 a.m.-5 p.m. Monday through Friday; 9 a.m.-6 p.m. Saturday; and 1 p.m.-5 p.m. Sunday. For more information call 513-369-6900. Visit http://www.CincinnatiLibrary.org/programs/exhibits.html. There is also a Live Nativity, at Loveland United Methodist Church. This event is free to the public, and hot chocolate and cookies are provided. It is a rebuilt town of Bethlehem where visitors are guided through the scenes by Luke in the retelling of the Birth of Jesus.